The “Aware Ego” process is a totally new concept and one of the Stones’ major contributions to the understanding of the psyche. This definitive series builds upon prior knowledge of Voice Dialogue, Relationship, and the Psychology of Selves. 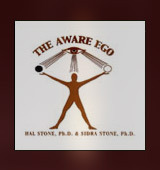 In five and one-half hours of discussion, exercises, and demonstrations, Hal and Sidra lead you on a fascinating in-depth exploration of The Aware Ego process and its role in both the earthly and the spiritual aspects of your life.